Second Vice President Gary Moore and Executive Director Matt Chase toured the Kenton County, Ky. 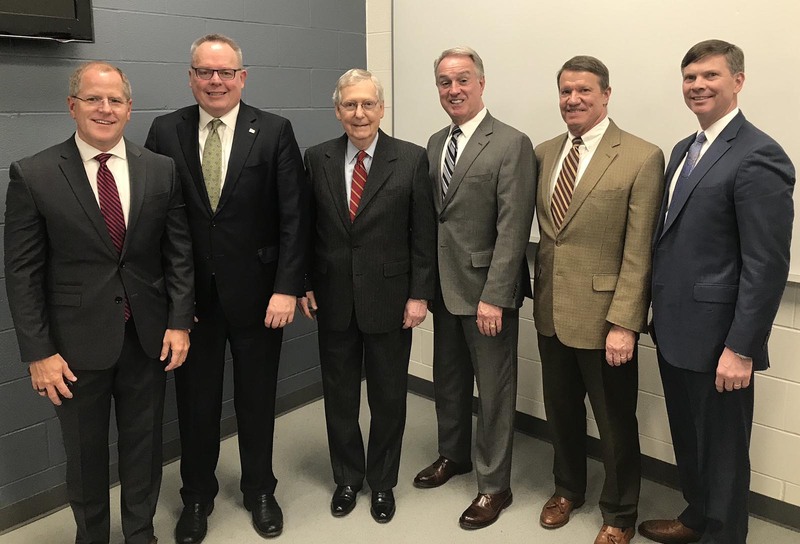 Detention Center March 18, along with Senate Majority Leader Mitch McConnell (R-Ky.) and Office of National Drug Control Policy Director Jim Carroll. President Greg Cox spoke at the Michigan Association of Counties March 25. West Region Representative Gordon Cruickshank briefed the Payette Forest Coalition March 21 on his meetings with USDA Secretary Sonny Perdue and Forest Service Chief Vicki Christiansen during the Legislative Conference. Northeast Region Representative Christian Leinbach pitched NACo’s TestIT app to the Tri County (Berks, Chester and Mongtomery counties, Pa.) March 21. Central Region Representative Cindy Bobbitt spoke to the Association of County Commissioners of Oklahoma about the TestIT app March 21. South Region Representative Ruby Brabo met with Virginia Secretary of Veterans and Defense Affairs Carlos Hopkins to speak about veteran suicide and access to care. Deputy Executive Director Deborah Cox gave an update on NACo’s legislative priorities to the International City/County Management Association’s Governmental Affairs and Policy Committee March 9. Chief Innovation Officer Cheryl Burnett spoke about Opportunity Zones to The Summit, a symposium held in Weber County, Utah, March 15-17. Program Manager Jack Morgan spoke about economic diversification in coal-impacted counties at the Colorado Plateau Economic Development Symposium in Coconino County, Ariz. March 7-8. Program Manager Nastassia Walsh provided an update on NACo’s Stepping Up campaign at the Iowa State Association of Counties’ Spring Conference March 15 in Polk County (Des Moines). Associate Program Director Rashida Brown presented information about the Pritzker Children’s Initiative to the N.C. Early Childhood Action Plan Presentation and Workshop March 21 in Transylvania County, N.C. Associate Program Director Kathy Rowings provided training to state criminal justice leaders on effectively engaging with local stakeholders in Hartford County, Conn. along with the National Criminal Justice Association, March 14-15. Associate Legislative Director Blaire Bryant outlined NACo’s partnership with the National Sheriffs’ Association at a meeting of the National Association of City and County Health Officials in Washington, D.C. March 14. At the County Commissioners Association of Pennsylvania meeting in Dauphin County, Pa. March 25, Associate Legislative Director Jessica Jennings gave an update on unmanned aerial vehicles (drones), Associate Legislative Director Arthur Scott briefed attendees on NACo’s broadband mapping efforts and Matt Chase provided a general update on NACo.